The Statler in downtown Buffalo is an amazing venue for a wedding. It is even beautiful for the portraits. Nina and Greg had a November 2016 wedding. Their ceremony was at St. Louis RC Church. We went to Buffalo City Hall for photos. The weather was not too great that day. It was really windy, cold, and rainy. The bride and groom thought it was best to go to the Statler early for photos. They were having the wedding reception there, so it was fine to go in early. While the bride and bridesmaids were freshening up, we took the groom and groomsmen into the lobby bar. They all had cigars for later and wanted to use them for a photo. We used the furniture that was in the bar to set everyone up. 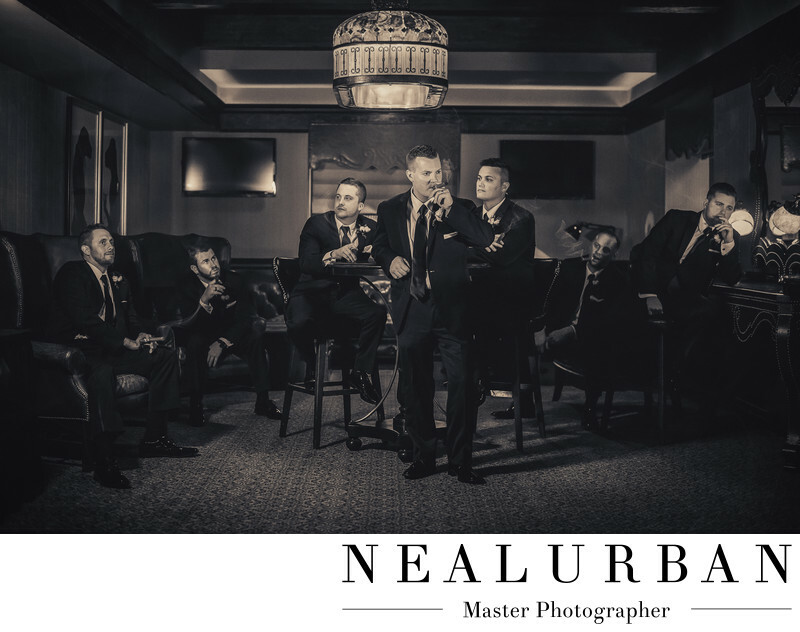 Neal Urban wanted a cool manly look for this image. He had all of the guys look off in different ways. He didn't want anyone to look at the camera. I was standing to the side with lighting. We wanted the image to be dark, but still needed to see Greg. The image looked amazing, but Neal knew he was going to edit it black and white. The image ended up having a roaring twenties feel. It was awesome. Greg loved it and it was one of the photos they included in some wall art they printed through us! It was also in two wedding albums Neal Urban Studio designed for them. We had already worked with Nina and Greg for engagement photos. We did them near the Wilson Boat House in Wilson, NY. There were boats docked and were able to use them for photos. Then we went around the corner to Nina's parents house to use the back yard for some images. Lastly, we went to the Daisy Barn Camp Ground for sunset photos on Lake Ontario! It was an amazing engagement session.